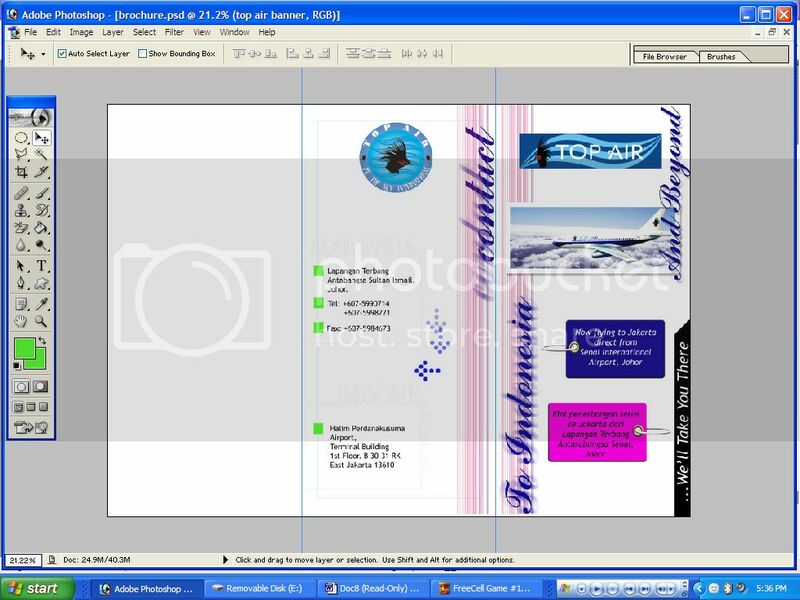 So lepas je Chairman kasi laptop dia kat aku (PC aku tak de Photoshop), complete ngan Adobe Photoshop 7.0 yang dia install malam tadi, aku pun mula la buat sket research & went all out to design something 'clean' and 'fresh'. Was thinking of having black background, but considering that black is easily related to 'death' & last night's news of plane crash (Mandala Air) in Medan is seriously shocking, I don't fancy the idea of putting off people to board the new airline we are promoting. Well. Baru je sampai 2 page macam nih. It's kinda hard as brochure (unlike posters, Chairman) ought to have a theme of some sort, with uniformed pages in order to look like a professional brochure (take note, Chairman).